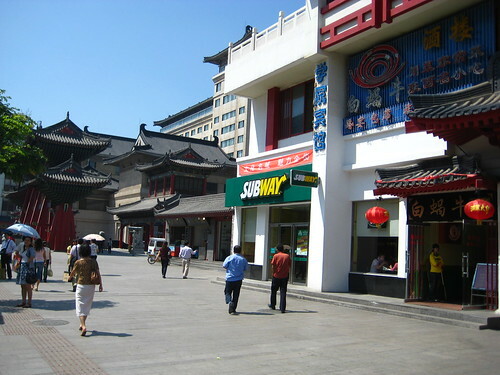 When I arrived in Xi’an, my stomach was a-rumblin’ — and when I spotted the city’s Subway restaurant, I made a b-line for it. I’ve been craving a sub ever since I left the States, and this was the first Subway I’d seen in all of Asia. Upon entering the store, I felt instantly like I’d been transported to somewhere in Idaho or Nebraska. The Subway was full of white people, mostly American tourists. Aside from the four Chinese “sandwich artists” (as they call them in Subway corporate literature), everyone else was Caucasian. I took my place in line behind a round middle-aged couple wearing fanny packs. I guessed by their clothing — and their figures — that they were American as well. The man went on about how he was craving a Spicy Italian sub on Parmesan bread. That was exactly what I was planning to order as well. It seems that there’s a whole lot more that unites us as Americans than geographical proximity and our blue passports. I should have known that Subway would be the local hangout for westerners. It would have gone out of business if they intended to sell to the locals, because Chinese people don’t eat sandwiches. When I ordered my Spicy Italian on Parmesan, the sandwich artist took my order with expert precision, understanding every word I spoke in English, from “banana peppers” to “vinegar.” You don’t meet many fast food workers in China with perfect English…I suppose because they’re used to speaking with Chinese people. But this was Subway. This girl may never eaten a sub in her life before she was hired, but she sure made me a good one. I took the sub to the dining area, nestled in among the other Americans and western Europeans, and enjoyed my sandwich…complete with a package of Sun Chips and an American-sized cup of carbonated soda. It felt like home.